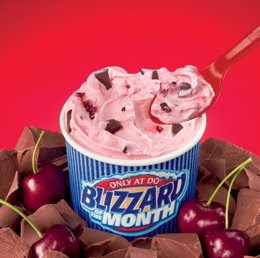 Yes, it's the moment you've all been waiting for - the unveiling of the February Dairy Queen Blizzard of the Month. Ah, best to keep on waiting. This one looks horrid. Choco Cherry Love, is its name. One disgusting flavour seems to be its game. DQ state that those red fleshy blobs are real cherry chunks. Am I the only one who feels compelled to gag? Granted, the colour of this Blizz is appropriate for Valentine's month but still .... I won't be showing this concoction any love. Blech. Ew...I don't think that I can. Ugh. Fruit. Must leave out the fruit in the Blizzard. And double up on chocolate. A must.